High Impact Practice:Develop, implement, and monitor supportive government policies. Policies set the tone for family planning programs. “Supportive policies ensure that family planning has a prominent place on the national agenda and that adequate financial resources are allocated. Operational policies support systems for delivering services” (Richey et al., 2008). Ministries of Health play a primary role in developing health sector policy, with the aims of improving health system performance and promoting the health of the people (WHO, 2000). Policies and laws that affect health systems and health outcomes are also developed outside the health system. This brief describes various policy levels, the importance of policies for family planning, and tips on supporting and implementing effective policy change. Developing and implementing supportive government policies is one of several “high-impact practices in family planning” (HIPs) identified by a technical advisory group of international experts. When scaled up and institutionalized, HIPs will maximize investments in a comprehensive family planning strategy (USAID, 2013). For more information about other HIPs, see http://www.fphighimpactpractices.org/overview. Laws, regulations, codes, and policies affecting the operations of a health system range from those governing import duties and budget allocations, tenders, and purchases of contraceptives at ministerial levels to those influencing how health personnel at the primary care level spend their time and the quality of treatment clients receive at the facility level. Often, barriers to accessing high-quality health services have their roots in non-existent, inadequate, or conflicting policies (Cross et al., 2001). Tables 1-3 provide examples of three levels of policies from Asia, Latin America, and sub-Saharan Africa. Constitution Overarching legal authority for laws and policies and for guarantees related to right to health, human rights, equity Article 61 of Paraguay’s Constitution establishes the right of every individual to freely and responsibly decide the number and spacing of their children (Political Database of the Americas, 2011). Social Security Institute to purchase and provide contraceptives for its beneficiary population, hence ending its dependence on contraceptive donations. Financial framework Size of the total government health budget sets the overall limit on what a government can spend In 2006 Paraguay’s Congress sanctioned a new law entitled Funding of Reproductive Health Programs and Provision of Safe Birth Kits, which earmarks funds to procure reproductive health commodities, including contraceptives. By 2010, the Government of Paraguay accepted full financial responsibility for the purchase of contraceptives (Quesada et al., 2006). Regulation of contraceptives Quality assurance of contraceptives; facilitate import of contraceptives and supplies Paraguay Law 4313 allows for the procurement of contraceptives through UNFPA, which facilitates quality assurance. Regulation of the private sector Extent and quality of health services available through the private sector Following operations research demonstrating that nurse auxiliaries effectively inserted IUDs, administered DepoProvera injections, and did Pap Smears, the Ministry of Health changed the National Women’s Health Service Delivery Guidelines to allow nurse auxiliary workers to provide those services in rural Honduras (Ravenholt et al.,2006). Laws and policies can protect individual reproductive rights, and they represent political commitment to develop systems that support these rights. Laws and policies can codify and articulate the commitment of countries to respect, protect, and fulfill reproductive rights (Hardee et al., 2013; Rodriguez et al., 2013). For example, the Republic of South Africa Constitution guarantees people the right to make decisions concerning reproduction (ZA Const. art. XII, § 2). Laws and policies can also set standards for family planning financing and for regulation of contraceptive quality and of private-sector providers of family planning services. Policy plays a critical role in scaling up and sustaining health interventions. Scaling up evidence-based innovations requires integrating new practices into health programs and services, including addressing the policy dimensions of scaling up. Without attention to the policies that underlie health systems and services, the scale up of promising pilot projects is not likely to succeed. Clear, up-to-date clinical guidelines maximize safe access to services. Evidence-based clinical guidelines promote the effectiveness, safety, and overall quality of care for the delivery of reproductive health services. Global experts regularly review and update international recommendations based on current evidence. For family planning, the World Health Organization’s Medical Eligibility Criteria for Contraceptive Use and the Selected Practice Recommendations for Contraceptive Use are the most commonly recognized authority. National guidelines should be reviewed routinely to ensure that they reflect international standards. standards of quality, outline roles and responsibilities, facilitate coordination, guide resource mobilization, and determine timelines for program rollout Bangladesh’s 2011 Health Policy is based on the country’s constitutional obligation to the right to health. The Health Policy includes objectives to strengthen and expedite the family planning program, both to attain replacement fertility and to make the program more acceptable, easily available, and effective among extremely poor and low-income communities (MOHFW, 2011). health service decisions The authority for providing family planning services in Indonesia was decentralized in 2004 from the National Family Planning Coordinating Board to 400 local governments (Habsjah, 2009). Comprehensive national guidelines clarify standards for provision of contraceptives by non-traditional service providers. A review of family planning clinical practice guidelines in 13 countries in sub-Saharan Africa found that national guidelines were generally inconsistent with current evidence (Wilson et al., 2011). Many of the guidelines restricted the provision of contraceptives by lower-level providers or provided little or no guidance about which methods could be provided through the private sector, such as pharmacists and drug shop keepers. National policies direct program implementation. A review of 23 case studies of some of the earliest (1950-1980) family planning programs from a wide variety of social and economic environments found distinct differences in those programs that achieved rapid success in contraceptive adoption and fertility decline compared with those that experienced lagging improvements (Robinson et al., 2007). The authors of the review concluded that strong support for supportive family planning policies was one of the key contextual factors for the most successful programs. Strong, consistent program leadership was present in two-thirds of the programs that performed better and in virtually none of the low-performing programs. In addition, family planning programs in countries with higher levels of education, higher status of women, and modern transport and communications systems all achieved progress more rapidly than did those that lacked these elements. Five of the most “lagging” programs lacked strong, widespread support for family planning policies and none adopted family planning policies with broad popular consensus (Robinson et al., 2007). The majority of the lagging countries had weak leadership, and the family planning programs in these countries worked outside the Ministry of Health network; as a result, they had little access to facilities, personnel, or research and evaluation resources (Robinson et al., 2007). More recently, Ethiopia, Malawi, and Rwanda experienced dramatic increases in contraceptive use. 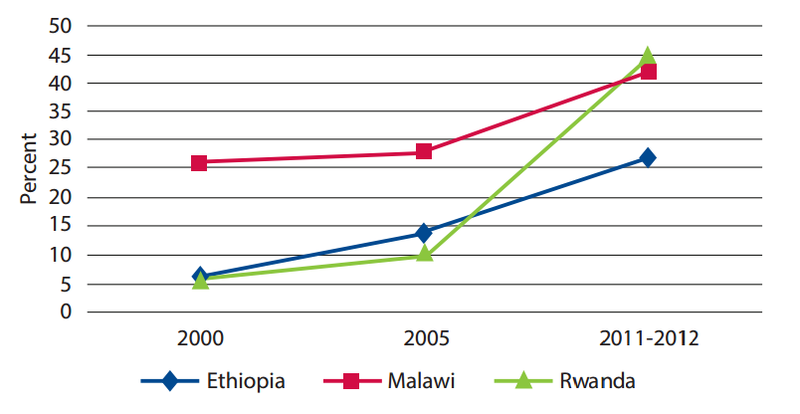 The annual increase in modern contraceptive prevalence among married women of reproductive age was 2.2 percentage points in Ethiopia (2005–2011), 2.4 points in Malawi (2004-2010), and 6.9 points in Rwanda (2005–2010) (see Figure). These achievements were underpinned by significant political commitment and policy changes in each country. In these countries, political commitment went beyond the health sector, and family planning was explicitly recognized as a key contributing factor to national priorities of gender, youth, women’s empowerment, rural development, and improved education. Programs benefited from notable champions and collaboration with both domestic and international partners. Ministries of Health led Family Planning Technical Working Groups, which functioned as collaborative forums for health and development partners. Innovative policies on task sharing expanded contraceptive choice at the community level, and public-private partnerships played a significant role in Ethiopia and Rwanda’s successful family planning programs. All three countries undertook substantial decentralization of health service delivery (USAID/Africa Bureau et al., 2012). Operational policies linked to the six WHO health systems building blocks Service Delivery Example: Guidelines/protocols Kenya updated its family planning guidelines to reflect WHO’s 2009 Medical Eligibility Criteria (MOPHS, 2010). Health Workforce Example: Health sector regulations and professional association guidelines for task sharing In 2011, Kenya issued a directive to enable trained community health workers to provide injectable contraceptives in underserved/hard-to-reach areas (MOPHS, 2011). Health Information Systems Example: Program requirements for reporting, monitoring, and evaluation A study of operational policy barriers to integration of FP/RH and HIV services in Kenya recommended identifying information needs for operationalizing proposed policies, along with integration indicators and an M&E plan that incorporates yearly objectives (Okundi et al., 2009). Medical Products, Vaccines and Technologies Example: Contraceptive methods that programs are allowed to provide Kenya’s laws and policies, including Kenya’s family planning guidelines, outline which contraceptive methods are provided in the country. Financing Example: Health sector budget Kenya has developed a Family Planning Costed Implementation Plan (FPCIP), 2010-2015 (MOMS et al.,2012). investment and oversight consistent with sector goals, system requirements, and client rights A 2010 health system assessment in Kenya recommended that the government involve interested stakeholders, such as the private sector and civil society organizations, and provide incentives to strengthen their participation in the policy process (Luoma et al., 2010). Promote strong governance and participatory processes to support policy reform. Policy reform and implementation can be enhanced in an environment with strong governance (Islam, 2012). Governance refers to the ways governments and citizens interact to manage public affairs affecting different sectors, including health. On the government side, governance takes place in governmental entities, such as parliaments, regulatory agencies, and police forces, in addition to sectoral ministries. Governments work with the private sector, including by contracting them to provide health services. On the civil society side, advocacy organizations and community groups work with government to fill service gaps and to hold governments accountable to fulfill their roles. Individual citizens pay taxes, vote, and express views on policies and programs. Understand the policy process and involve the actors. An assessment of the policy barriers to integrating family planning and HIV in Jamaica found that health professionals were confused about the policies, regulations, and guidelines needed to make systemic changes and to institutionalize integration. Furthermore, the decentralized infrastructure of Jamaica’s health system contributed to lack of knowledge and agreement about which level (central or decentralized) of the health system could reform relevant policies (Policy Project, 2005). Understanding the diffusion of policies throughout the health system is a key factor in supporting and implementing policies. Identify policy barriers and opportunities. When reforming and implementing policies, it is important to know the nature of policy barriers: Is there a lack of policy? A need to revise an existing policy? Are there contradictory policies or lack of implementation of an existing policy? It is also essential to ascertain who has the authority to make policy changes: legislatures or Parliaments, the Minister of Health, or a professional association (for example, physicians’ or nurses’ associations to approve task shifting). After this information has been identified, articulating the process for policy change and identifying opportunities for political change or policy shifts are essential to policy reform. Ensure policies and programs are fully funded and resourced. Family planning costed implementation plans—management tools that include cost estimations for multiple years—are being prepared in many countries. Program costing is a critical component to ensuring fully funded programs and successful program implementation. The costing of family planning programs identifies the resource needs for strategic areas, such as commodities and logistics, capacity building of health workers, service delivery, advocacy, management systems, and monitoring and evaluation. Civil society should be involved in advocating for full funding; this will help ensure capacity development of local organizations for strong advocacy voices in resource allocation and spending. Invest in communication and training to facilitate policy implementation. Opportunities for discourse should be created. A study of policy implementation in India identified conflicts between different actors’ ideals of performance of core tasks and conformance with policy. A key barrier to implementing policies included problems in communicating policy ideas among the actors. Researchers found these challenges were compounded by a lack of forum for discourse and exchange of ideas (Sheikh et al., 2010). Ensure that human resource capacity is sufficient to implement policies. This may require training of managers, administrators, clinicians, and others, as well as changes to pre-service curriculum for clinical staff. Address the five components of policy implementation. Ensure that: (1) institutions expected to implement the policy, both at the national and decentralized level, are clearly defined and attention is paid to the relationships and power dynamics among the organizations; (2) organizations have capacity to implement the policy; (3) financing is sufficient and resource allocation mechanisms are in place to fund the policy; (4) policy is accompanied by strategic planning and policy barriers analysis; and (5) strong monitoring and accountability systems are in place (Hardee et al., 2013). Are there any laws or social norms that prohibit aspects of the practice to be scaled up? Is the practice supported by a national policy? Are there any barriers to financing institutionalization of the best practice? Will it fit within country financing guidelines or be part of the recurring budget rather than a development budget funded by donors? Do operational policies, or the rules, regulations, guidelines, operating procedures, and administrative norms that guide implementation, need to be developed or reformed to enhance implementation and scale up of the best practice? Who are the champions who can be engaged to drive the change? Ensure that policies and strategic plans are periodically reviewed and kept up to date. If policies and strategic plans are not sufficiently current, they will not be responsive to societal, cultural, or environmental changes. The strategic plan guiding family planning should be adjusted annually based on updated information on health status, services, and the political environment. Monitor policy implementation. Civil society and advocates should be supported to monitor policies and ensure they are translated into action. Indicators, benchmarks, and reporting requirements should be included in policy and implementation documents. New policies should be monitored for unintended consequences using validated methods and by employing social auditing methodology. Evaluation of new policies should include evaluations of decentralized financing, performance-based incentives, removal of user fees, and voucher strategies, among others. See Table 4 for illustrative indicators for this process. For more information about High-Impact Practices in Family Planning (HIPs), please contact the HIP team at USAID at [email protected]. Ministry of Public Health and Sanitation (MOPHS), Office of the Director [Kenya]. Directive: provision of Depot Medroxyprogesterone Acetate (DMPA injectable contraceptive) by trained community health workers (CHWs). Nairobi: MOPHS; 2011. * Quesada, Nora, Varuni Dayaratna, Wendy Abramson, Jay Gribble, Verónica Siman Betancourt, David Sarley, Carlos Lamadrid, Nadia Olson, and Juan Agudelo. 2006. Contraceptive Procurement Policies, Practices, and Options: Paraguay. Arlington, Va.: John Snow [JSI] DELIVER and Washington, D.C.: USAID | Health Policy Initiative TO1 for the U.S. Agency for International Development. Sheikh K, Porter J. Discursive gaps in the implementation of public health policy guidelines in India: the case of HIV testing. Social Science and Medicine 2010;71(11):2005-2013. U.S. Agency for International Development (USAID). Health Systems 20/20: request for applications (January 30, 2006, RFA Solicitation No. M/OAA/GH/HSR-06-189). Washington, DC: USAID; 2006. * Wilson L, McGinn E, Yacobson I, Stanback J. How well do national family planning guidelines from Africa adhere to international guidance? A review of guidelines from thirteen countries. Unpublished; 2011. This document was originally drafted by Karen Hardee, Shawn Malarcher, and Linda Cahaelen. Critical review and helpful comments were provided by Moazzam Ali, Patty Alleman, Michal Avni, Bruce Campbell, Elaine Charurat, Barbara Deller, Mary Lyn Gaffield, Jay Gribble, Rehana Gubin, Bui Thi Hong, Roy Jacobstein, Jacqueline Mahon, Erika Martin, Erin Mielke, Egard Naraez, Leslie Patykewich, Anne Pfitzer, Suzanne Reier, Adriane Salinas, Shelley Snyder, Ellen Starbird, Patricia Stephenson, Nandita Thatte, and John Townsend. This HIP brief is endorsed by: Abt Associates, Bill & Melinda Gates Foundation, EngenderHealth, FHI 360, Futures Group, Georgetown University/ Institute for Reproductive Health, International Planned Parenthood Federation, IntraHealth International, Jhpiego, John Snow, Inc., Johns Hopkins Bloomberg School of Public Health Center for Communication Programs, Management Sciences for Health, Marie Stopes International, Pathfinder International, Population Council, Population Reference Bureau, Population Services International, Save the Children, United Nations Population Fund, University Research Co., LLC, and the U.S. Agency for International Development.